This past weekend in Missoula we had a science fiction convention called MisCon, organized by our very own CthulhuBob. (If you attend Origins, you will sometimes see Bob manning one section of that mile-long desk.) CthulhuBob invites guests from various sectors, usually an array of writers, artists, and game designers. This year, the game designer was James Ernest. Several weeks ago, we were excited about the prospect of gaming with Mr. Ernest and his latest work, the Stonehenge Anthology Board Game (I should mention that this was a group project in which James Ernest, Richard Garfield, Bruno Faidutti, Richard Borg, and Mike Selinker designed very different games using the same components). Unfortunately, Stonehenge reached distributors during the MisCon weekend and not even James Ernest had a copy. Bad timing for us, but I'm glad it's now out. We invited Mr. Ernest to do a signing at our vendor booth, which he accepted. At the appointed time, he showed up, and we all sat down around a table to play a game. What game did we play, you ask? Kill Doctor Lucky? Gloria Mundi? Give Me the Brain!? In fact, we played perhaps the single favorite game of James Ernest, a game he did not invent: Texas Hold 'Em Poker. This experience was brutally painful for me. Don't get me wrong; I had a ton of fun. But I became aware of just how little I can control myself while looking at small amounts of information. Before I go on, I should say that we weren't playing for money. The game was stripped of a key component, like taking the doubling cube away from backgammon. I in no way am comparing this to a normal poker game in which monetary stakes matter. It was a game of information and control, and perhaps there was a little pride on the line. Given all that, I learned some key lessons that apply to all of my gaming. The following are social lessons, easily forgotten in the realm of friendly gaming, but which became quite obvious to me in the poker game. Lesson #1: There is a personality unique to the stresses of every game which comes to the surface. In a game, you're on stage. How well you act can sometimes affect the outcome of the game. With everything stripped away in a poker game, I became aware of how uncomfortable I am with casual banter. I saw in myself a simple pattern: if I'm in a good position, I can relax and talk, and if I'm in a bad position, I tend to clam up. Breaking patterns like this can be a strategic edge. Lesson #2: Hands can betray a wealth of information. This was terrible. I did not know what to do with my hands. Sometimes I would throw in a chip even though I had put up the single blind we were playing with. Sometimes I would throw in another chip when the bet had come back to me, even though I hadn't intended to raise. This could be chalked up to beginner stuff, but I honestly think that it can be reduced to the fact that I couldn't control my hands. Before I knew it, I had betrayed my card hand with my actual hands. This hand control made me think of other games. How many euros use cards? How often had I done similar things in all of my favorite games? And what am I doing with my hands in euros that use other mechanics? Lesson #3: If I'm not watching other players, I'm depriving myself of valuable information. Usually, I try to take account of other people, not just their actions. During the poker game, I just wasn't picking up on anything, and all the relevant tells fell below my radar. I suppose this can be rectified by folding and watching. Not so in most euros during which you participate most of the time, though I don't rule out watching people. Sometimes I get bogged down with my own plans that I don't set aside a bit of time to watch other players. The above lessons are simple to be sure, made painfully obvious by a simple no-stakes game. I just wonder what would happen if I improved my poker game. Would my other gaming improve as well? So much control is necessary for an effective gaming presence. Calculations have their place, but what would one be without the other? Maybe you can get away with a lack of personal control in a game of open information, but it sure couldn't hurt. James Ernest was in Missoula for the duration of MisCon. During that time, he came to the World Games of Montana booth a couple of times to play poker. He clearly knew what he was doing in the game while most of us blundered away. We all ended up with a couple of big wins, but how much of that did we deserve? I have always been curious about poker and the skills necessary to play it. I am also curious about my fellow gamers who play poker. Does playing poker well help you in other games? Or do you take a solid approach to all gaming? How do you practice control at the gaming table (regardless of the game)? Have you ever lost a euro-game because of an unconscious disclosure of information? Q: If my name SMATT were a cryptogram, how many different games could you spell? A: Here are a few: CHESS, DVONN, FLUXX, CADOO. This is a personal story about a magician which will lead into the puzzler. * I appreciate all guesses, but please don't post them. If you think you have the answer, write smattathias@gmail.com. Thanks! There were only four of us at the Appalachian Gamers meeting this week, and so we decided to play some games that seldom get to the table because they don’t play more than four. I requested Lowenherz, the 1997 Klaus Teuber game that was printed in the USA by Rio Grande Games. I had not played Lowernherz before and Ted Cheatham has raved about it. I now agree with Ted. This is a great game. In fact, I hope that someday it gets reprinted. Now, many of you probably know that a variant version of Lowenherz is still available. I am referring to Domaine, a Mayfair game that may actually have prettier pieces than the original Lowenherz. And after looking at Boardgamegeek, I can safely say that there are people who prefer Domaine to Lowenherz. And that’s fine. Maybe someday I will get a chance to play Domaine. But for now, Lowenherz has captured my imagination. Let’s talk about what the games have in common. Both games are semi-abstract games of medieval conquest. Players try to enclose areas of the board with walls, and then score points for every square they’ve captured. Cities enclosed in your areas yield big bonus points. Control of each area is indicated by the colored castles and knights inside it. Additional knights can be placed next to your castles and knights that are already on the board. But once placed, knights don’t move; this isn’t a true wargame. Instead, a player can expand one of his enclosed kingdoms if his kingdom has more knights than an adjacent kingdom. This creeping expansion can slowly rob adjacent kingdoms of valuable victory points. What are the differences between Lowenherz and Domaine? The biggest difference is how actions are taken. In Domaine, each player has a hand of action cards and can play one on his turn. A simple, clean mechanism with no conflict. In Lowenherz, one card with three actions on it is drawn every turn. Players then try to claim one of the three actions, and conflicts arise when two or more players try to claim the same action on the card. These conflicts can be settled either with negotiation, or by an auction if players can’t reach an agreement. These conflicts and negotiations are often the most interesting part of the game. The one-card mechanism generates a lot of in-your-face confrontations. The continuing process of building walls also generates conflict on the gameboard. At the start of the game, there are lots of wide open spaces, and players need not expand at someone else’s expense. But as the walls come up and kingdoms are formed, conflicts with your neighbors can no longer be avoided. Late-game expansion usually comes at someone’s expense. There can be element of smack-the-leader to the game, but there are also some strategy cards that can make this syndrome counter-productive. When players are allowed to take a card, they get to search the deck for the card that they think will help them the most. Among these cards are ones that generate extra victory points at the end of the game. You can try to smack the leader, but if one player is squirreling away several victory point cards, you may not know the real leader is. In our game, I won because of hidden victory points. Lowenherz is a smart strategy game for people who don’t mind tense struggles for power. Whenever we only have only four gamers at the table, I may ask to play Lowenherz. And I hope someday to see it in print again. In my real life I work for Skotos Tech, an online gaming company that's increasingly becoming an online entertainment company. Our newest site, which I launched last week, is Xenagia, a community site all about fantasy, science fiction, and horror. Thus far we've got a forum and a book index, with plans to add reviews in a couple of weeks. Because of my work on Xenagia, I've been largely immersed in these three genres over the last couple of weeks, and that's what led to this article, talking about science-fiction and fantasy (and to a lesser extent, horror) in gaming. Fantasy and science-fiction have, of course, been around for quite some time. Frankenstein (1818) is often referenced as one of the earliest entrants to the genre, but it took until the 20th century for more regular publication to occur. H.P. Lovecraft was writing great pulp science-fiction/horror stories in the 1920s and 1930s, then Robert E. Howard's Conan appeared in 1932 and Fritz Leiber's Fafhrd and Gray Mouser appeared in 1940. However it wasn't until the 1960s that genre fiction burst into the mass market, and that was thanks to J.R.R. Tolkien. His famous Lord of the Rings first appeared in Britain in 1954 and 1955 and received some slight attention. Then in the 1960s it appeared in the United States, first in an illegal edition from Ace Books, then in an authorized Ballantine Books edition. It was that later Ballantine edition that was discovered en masse by the Baby Boomers. Suddenly "Frodo Lives!" pins popped up at anti-war demonstrations and at love-ins. Tolkien's books became a touchstone for the generation, and they were just a part of a burgeoning flock of science-fiction and fantasy publications that achieved wider success than their niche predecessors. Robert Heinlein's Stranger in a Strange Land (1961) and the Lancer/Ace Conan books (1966-1977) were others that thus escaped into the mainstream. The gaming field reacted to this in the 1970s when young designers brought up on these post-war science fiction and fantasy stories started creating games in their image. To that date all hobbyist game design in the United States had been centered on wargames. Now, however, a new game appeared that was more focused on individual characters and continuing games. That was Gary Gygax and Dave Arneson's Dungeons & Dragons (1973). Gygax and Arneson weren't the only wargame publishers that had been moving toward fantasy and science-fiction publication. Newcomers like Metagaming Concepts and GDW, all influenced by the new cultural landscape of the 1960s, were edging into this area as well. Even older stalwart SPI was trying out genre games. However it was the success of D&D that would turn the whole hobbyist gaming industry on its ear, leading everyone to start publishing genre games in increasing numbers. And that is what ultimately leads us today's gaming landscape, and its peculiar relationship to fantasy and science-fiction. In today's hobbyist gaming market there are broadly two types of games. The Anglo-American designs ultimately derive from those wargaming and roleplaying origins. Today most Anglo-American board game publishers--including names such as Steve Jackson Games, Atlas Games, Fantasy Flight Games, and Wizards of the Coast (through Hasbro's Avalon Hill imprint)--were originally RPG publishers. The designers' ideas about game design are thus usually based on decades of American hobbyist publications. Because of those origins, they also tend toward the science-fiction and fantasy themes. As I've written elsewhere Anglo-America games are usually theme-heavy and mechanics-light. The games often lean toward the simulationistic, giving up simplicity for realism. The German designs, meanwhile, derive ultimately (I think) from the SdJ, Germany's game of the year award. Thanks to powerful economic incentives the SdJ has encouraged a very specific type of game design which is generally lighter and more casual--and which typically has better designed and more carefully considered mechanics but less theming. And, the German games have typically avoided science-fiction and fantasy themes, partially because of their orientation toward the mass (German) market and partially because they don't have the historical origins in those genres than the Anglo-American hobbyist market does. And from those two core types of games spawn a third: the hybrids. These are games published in countries other than the United States, Britain, or Germany. Without the institutional rules set by historical precedent, they're more able to pick and choose among the two major design schools. Thus games coming out of France and Italy in particular have been more free to use fantasy and science-fiction themes, but with abstract and polished Germanic mechanics. Increasingly American companies are also moving in this direction, with games from Atlas and Fantasy Flight in particular showing German design influence matched with more American themes. And with that overview out of the way, let me briefly mention my top ten fantasy, science-fiction, and horror games, with some attention paid to where they came from. I expected to have troubles coming up with top-rate fantasy games, but as it turns out there are a number that I was able to name without regrets. Fantasy Flight's superb wargame A Game of Thrones probably belongs here too, but I've instead given the space over to the more fantastical offerings. Fairy Tale and Dragon's Gold are two games that just barely missed my cut off for this list. Descent. Anglo-American design, Fantasy Flight Games. A member of the "adventure game" genre, which has traditionally presented board games that are very similar to roleplaying games, thanks to the play of individual characters. Descent is quite simply the best of class. Each game you push your characters through a dungeon while the gamemaster throws monsters at you. If you can accomplish the goals, you win. It's a bit on the long-side, but has superb mechanics and ever better theming. Though high-quality fantasy games are well-represented, I can't say the same of science-fiction. The following games are all good, but none of them reach the heights of Descent, Dungeon Twister, and Lord of the Rings, which are all superb exemplars of the fantasy genre. I know some people would include Starship Catan and Spacefarers of Catan in this listing, but they've generally struck me as too long and some of the weaker members of the Catan franchise, and don't rate as high for me as anything included below. Just as there was a step-down from fantasy to science-fiction in number and quality of games, I think the same is true from science-fiction to horror. I almost left this category blank entirely. I know some people would include Betrayal at House on the Hill (which I find entirely random and poorly produced) and Fury of Dracula (which I've never played due to length). Beyond that, there isn't a lot exciting in horror, though I've played some cute themed card games, and any number of amusing (but not well-designed) Lovecraftian games. At first I was taken aback - you mean that's a bad thing? But the longer 2 I thought about it, the more I can see where he was coming from. If a game draws you into your personal planning too much - it can cease being a game and become more like a puzzle - at which point the non-puzzle inclined will enjoy the game less. A common complaint about some of the longer, more detailed games is the propensity for solitare play. Not outright solitare, but an odd mutated form of solitare where interaction with the other players occurs, but ultimately doesn't have as much an impact on your play as your own strategy and long-term planning. A game I highly enjoy - Roads and Boats, epitomizes part of this complaint. There is plenty of interaction in Roads and Boats 3, but ultimately your own optimization of routes, deliveries, and production will have a greater effect on the final standings than interplayer decisions and contests. Back over to TtA 4, this game also relies on personal optimization and decisionmaking - with a small bit of player-smacking to keep players honest. Ultimately this reliance on personal optimization does create a game that encourages 'heads down' play. So we have 'heads down' play. Heads up play often isn't very contemplative. You don't have time to puzzle out a tricky valuation, or internally debate the relative merits of a temple placed in hex A or hex B. You might think you have time to decide, but often the game, or players won't allow it. Of course, like life, most games fall halfway in-between the heads up and heads down spectrum. Wolfgang Kramer's action point games reward both personal planning as well as reactionary defense and attack moves against other player's pieces. Mostly, I think it's important not to confuse the concept of heads up/down with game weight. Heads down appeals more to puzzlers, and Heads up to players who find the optimization distracting enough to stop them from watching what the other players are doing. This is probably the biggest complaint about a 'solitare' game - that the game causes players to miss what the other players are doing, which takes away from the group dynamic. I've used heads down and heads up because that's what started me thinking about this spectrum of games. Perhaps a better set of terms would be internal/external. 1 I am actually paraphrasing here. 2 Days, almost a week, not seconds. Sometimes I'm not a quick thinker. 3 Enough interaction to foster long term grudges, and frantic wall building and blockading. Roads and Boats must not only undergo labels such as "multi-player solitare", but also can fall squarely into the "let's you and him fight so that I win" camp. 4 Where player interaction is entirely focused on smacking the player with the least military. Which is often the player who is doing best in non-military, point-generating, game winning stuff, but not always. 5 In modern art, tracking not only the current painting up for auction, bidding on said painting, tracking who is bidding on said painting, what people are willing to pay for said painting, and what players have purchased so far this round. Personal strategy loses to groupthink and interplayer reactivity every single time. except for the 'I'm not buying anything strategy'. Which just loses. I can always find an excuse for buying a game, even if it is a game that I might not be playing anytime soon. I can justify buying monster war games that I won’t be playing with the Appalachian Gamers by telling myself that these are retirement games I will play when I have a room where I can leave a game set up for weeks. But I’ve noticed another excuse creeping into my head recently. I’ve been telling myself that certain games are ones that I will be playing with my daughters when they are older. I have daydreams about dull rainy weekend afternoons suddenly enlivened when I pull some board games off the shelf. Although I can steer my daguhters’ interest toward games, I have no idea what kind of games they will like five or six years from now when they are old enough to play the simpler adult games. They like dinosaurs now, but I find it difficult to believe that they will be clamoring for dinosaur games half a decade from now. My best guess is that they are most likely to enjoy the same novice-friendly Euro-games that I show to my non-gamer friends. Games like Ticket to Ride, Settlers of Catan, Alhambra, Around the World in 80 Days, or Pillars of the Earth. I tend to enjoy games a little heavier than these, but I’ve had success bringing some of these games out when non-gamers are around. My most recent purchase that prompted my gaming-with-daughters excuse was Reiner Knizia’s latest expansion of his Lord of the Rings game. That is, Lord of the Rings Battlefields. In case you’ve missed it, Lord of the Rings is a cooperative game in which the players operate as a team of hobbits trying to make it to Mordor to destroy the evil ring. The cooperative aspect of the game appeals to me because I suspect that winning or losing as a group might prove more enjoyable than having a winning daughter lording it over a losing one. Lord of the Rings now has three separate expansions that make the game more difficult and more complicated. I can easily imagine playing the basic game with my daughters when they are twelve or thirteen, and then adding the expansions after they master the basic game. I did get to play one game using the Battlefields expansion with the Appalachian Gamers. As others have noted, the expansion could justly have been titled Lord the Rings Flowcharts because of the way the expansion gameboards channel the movement of the forces of evil. But that didn’t bother me; the rest of the game is also a fairly abstract version of the toils of Frodo. As I suspected, Battlefields increased the difficulty of the game. Substantially. Our party of four hobbits lost two members before arriving in Mordor. We stopped playing at that point because it was clear that the surviving members would only travel a few feet toward Mount Doom before being corrupted and killed. It is possible that the next time I play this game will be with my daughters many years from now. But one thing bothers me. My eldest daughter runs and hides whenever I play the movie version of Lord of the Rings on TV and Gollum makes an appearance. But if her love of dinosaurs is likely to fade, won’t her fear of Smeagol likewise disappear? I won’t know for years. I just recently learned the Thumbs Up game. Originating in Japan, it's something akin to Rock-Paper-Scissors. Both use simultaneous revelation as the main driving force, but there's something else going on in the Thumbs Up game that I think gamers will enjoy. Two to three people form a circle (you could add more but it gets a little out of control), and one is elected leader. Like in many Euros, the leader will switch in clockwise fashion. All players stick out two closed fists in front of them. The goal is to get both hands behind your back during the course of the game. On a count of "one, two, three," all players, including the leader, stick up two, one, or zero thumbs. The leader, instead of saying "three" will instead guess out loud how many total thumbs will be showing. If the leader is correct, he or she puts one hand behind his or her back. If incorrect, the role of leader goes to the next person clockwise. One more important rule: if the leader guesses zero and is correct, the leader wins outright. I've really enjoyed the Thumbs Up game. It usually takes less than a minute to play, and by the end, we're usually chuckling and congratulating the winner. I've tried four players, and that seemed like more than the game could handle. Two and three player games are fun, fast, and harmless. Could this be a filler between fillers? All players choose between the same three options, so as leader, you're trying to figure out who is more likely to go for all, none, or half of their thumbs. Usually this depends on what moves the other players did last. What kind of player would change? What kind of player will stay the same? You'll never really know when you make your guess, but it's still fun to try. Usually, simultaneous revelation is so hit-or-miss for me. The choose-your-island mechanic of Pirate's Cove is tiresome, yet the Castillo scoring in El Grande is really exciting. There's got to be some leverage or enough relevant information for the mechanic to work well. Though simple, I think the Thumbs Up game does a good job with simultaneous revelation. Because you know your own input, it's not quite as random as Rock-Paper-Scissors, but every game is still "anybody's game." While still a fan of a quick "best of five" game of Rock-Paper-Scissors, I think the Thumbs Up game makes for a nice change. Q: I'm thinking of a game. Drop every double letter (touching or not) from the game's title. You're left with the following letters R, O, and E (in that order). What's the game? I made a reference to a line of asterisks which equaled the number of letters in the game's name (11). I separated the two in case anyone wanted to try and solve the puzzler without the aid of knowing how many letters. Imagine my name SMATT was a cryptogram for the name of a game. Standard rules apply: each letter in my name equals another in the English alphabet. *I appreciate all responses, but please do not post your answers on the blog. If you'd like to respond, please feel free to email smattathias@gmail.com. Thanks! We got into the game and started playing and one of my opponent’s proceeded to begin failing a raid. After two missed rolls, I pointed out the house rule that I thought might help his situation (adding +1 to the last roll). He quickly pointed out that this is a game about Vikings and no stinking Viking worth his pelts would be caught dead with a wimpy sort of rule like that. He was going to “take it like a Viking” and didn’t need any special accommodations. He rolled (and failed if you’re curious – adding +1 wouldn’t have helped anyway) and that was the end of that possible house rule. The game proceeded on and good and bad luck was had by all. While some people had things roll their way more than others, I decided this was by no means a luck-fest. There was plenty of room in the game for solid strategy and planning. Once it has been played through a few times and people get to know the cards, there might even be occasions for lying low and waiting for particular things to show up. I may be slightly clouded in my judgment, since I ended up winning, but I felt the game was quite fun. I did have my fair share of poor die rolls near the beginning, but had fewer near the end when it was perhaps more important. Rolls I missed early and thought were crucial weren’t as important as ones I rolled well on near the end of the game. This also helped me as I was a smaller threat at the start of the game and was able to catch up rather than trying to continue to fight for the lead. The game took over two hours to play with four players but should go under two now that we all know the rules. While a tad long, that is an acceptable length for a game that has one’s fortunes tied to the vagaries of dice. Now that I have had a chance to reflect on the game, I have to acknowledge that I don’t mind the luck-factor at all, even without the house rules. One reason is the theme of the game. Sea voyages and plundering villages are risky propositions (as is creating new settlements or trading – all actions that can be performed within the game). Vikings were no strangers to risk, and if I’m going to play a game about Vikings, I don’t mind taking a few chances myself. I haven't played any games this week. I'm madly busy with work, and this weekend we took my dad away for his cousin's fortieth wedding anniversary. A road trip is fun. A road trip with two children can be fun, you just have to work harder. A road trip with five people - including two children - in one Subaru Outback is more of a challenge. Especially when the first 30 km or so go really, really slowly, and you don't arrive until after 10pm, so the 4 hour road trip takes 5 1/2 hours. 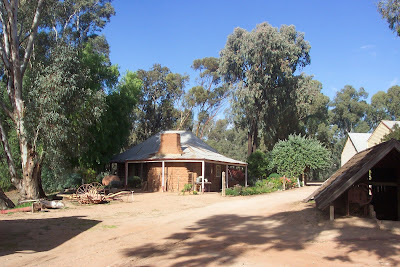 We hadn't visited the Swan Hill region before. It's north-west of Melbourne, on the border of New South Wales, and is primarily a fruit-growing region. But fruit wasn't the main point of interest. 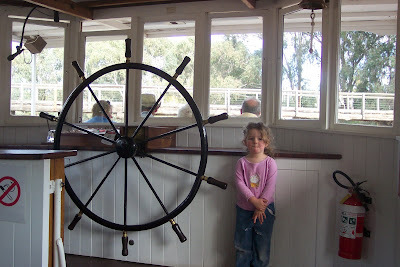 There was a big family event on Saturday night, and during the days we visited both local museums - the Pioneer Settlement was a great recreation of life in the 1830s through 1930s, with absolutely picturesque scenery as well as a 105-year-old paddlesteamer that we took a ride on. The highlight, though, because it was so different to anything I had seen before, was our visit this morning to the Catalina Flying Boat Museum (No. 1 Flying Boat Repair Depot) at Lake Boga. 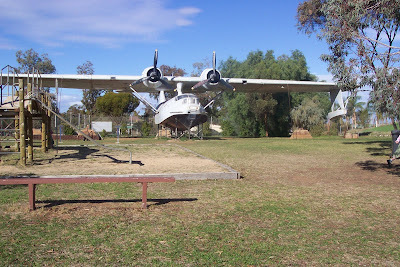 To anyone who knows that part of Australia, the idea of putting a flying boat repair depot in the middle of that rural area seems insane - but the idea was to hide the boats and keep them and the depot safe from enemy bombing. Anyway, games. That's what I'm meant to be blogging about. More game content next time, I promise. Last night I played only two games at our weekly Appalachian Gamers meeting, but it was a satisfying evening none the less. This was because both games were ones that I had never experienced before, and both were minimal-luck games that rewarded smart play. The games were Medina and End of the Triumvirate. I would call Medina a tile-laying game except that the game uses wooden pieces instead of tiles. In this four-player game, players place colored building pieces on the board in the hope of constructing and claiming clusters of adjacent building pieces. Each player can only place two pieces per turn, and colored building pieces can only be placed next to pieces of the same color until after any particular group of buildings of the same color is claimed. Once a building is claimed, no more pieces of that color can be added to it. When to claim the buildings is key. If you claim one too early, it will likely be a low scoring building. If you wait too long, then someone else will likely claim it. Because each player can only claim one building of each color, one possible strategy is to wait until all the other players have buildings of one color, and then build up your own building of that color knowing that no one else can claim it. But that strategy has its own risks; buildings that get a late start may get hemmed in by other buildings and be unable to grow. Adding to the strategy are various victory point tiles that can be claimed. The largest building of each color generates a victory point tile for the owner of that building. And there are extra victory tiles for players who use walls to connect their buildings to the towers in the corner of the board. I am not a big fan of tile-laying games, but Medina is an exception. It is smart, plays in about an hour or so, and is completely luckless. Medina was designed by Stefan Dorra and was published in the USA by Rio Grande Games. I believe Medina is out of print, but I will be keeping my eye out for a copy. End of the Triumvirate was designed by Max Gabian and Johannes Ackva, and was published in the USA by Z-Man Games. This is a light wargame based on the rivalry between Caesar, Pompey, and Crassus in the final years of the Roman Republic. The game rewrites history a good deal, because Crassus was actually dead when the Roman Civil War heated up between Caesar and Pompey, but this is a minor quibble. The game was designed to be a smart and easy-playing contest, not a detailed history simulation. Each turn players collect gold and legions in their various provinces. Gold is only placed in a player’s treasury if he has his leader piece in the region producing the gold. Gold in other regions is placed on the board—which means that players usually spend at least part of their movement allowance moving their leaders to pick up any spare change that happens to be resting in odd corners of the Roman empire. Legions can only be moved with a leader piece. This limitation keeps the game simple; each turn a player only needs to figure out what to do with the four movement points that his leader is allowed. At the end of the turn, players can try to influence the politics of the empire by spending gold. Players can improve their leadership on the political and military tracks, or try to win citizens to their faction by spending money. One game-balancing mechanism is the multiple ways of achieving victory. A player wins if he is elected Consul twice, or if he can bring his markers to the last space of the political and military competency tracks, or if he can capture nine regions and place all of his nine governors on the board. The multiple victory conditions means that one player may be leading in one area while other players are superior in others. In our game, I controlled more regions than other players for much of the game, but Ted and Travis were each elected consul once, and Travis built up the largest horde of armies. This superiority in legions eventually won Travis the game. On my last turn, I attacked Ted to knock him back on the competency tracks, but Travis then blitzed enough weakened regions to achieve military victory. End of the Triumvirate is not entirely a luckless game, but it contains so many balancing mechanisms that luck plays a minor role. During battles, the attacker draws colored cubes from a draw bag, and each colored cube can indicate the loss of a legion for the opposing player. But when players lose a battle, they get to place a new cube in the bag, and this makes future victories in battle more likely. End of the Triumvirate will appeal to wargamers, but it is simple and fast-playing enough to be enjoyed by Euro-gamers as well. Ted Cheatham (who owns the copy we played) is not a wargamer, but he finds the game enjoyable. If you have the opportunity to try either Medina or End of the Triumvirate, I would advise you to do so. Both are quality games. A week and a half ago a major interchange in the California Bay Area literally melted in a hellish inferno. Following a single-vehicle tanker truck crash, over eight thousand gallons of gasoline lit on fire, resulting in temperatures in excess of 2750° bathing the freeway. The metal frames holding the I-580 overpass together began to warp, and then one segment of the overpass came down in a thundering crash. As part of the infamous MacArthur Maze (which I pass through every week on a BART train on my way to EndGame and back), the I-580 overpass was a central part of the road system which moved traffic between the East Bay and San Francisco, and suddenly it was gone. Dire predictions were made on the effects on traffic. Thus far, it's apparently been bad, but not terrible thanks to Bay Area companies' willingness to allow employees to telecommute and our decent public transit system. Nonetheless, the I-580 overpass needs to rebuild and quickly. How can you find the company that could do it the quickest and cheapest? The answer was ... an auction. Last week Caltrans gave nine construction companies the opportunity to bid on the reconstruction. A bid contract of this type used to be pretty common for government projects in the days before the Bush Administration, and thus isn't really that unusual in itself. As does any good auctioneer, Caltrans also set an expectation: that the total cost should be about $5.2 million dollars. However, Caltrans also did something unusual: they introduced a very notable time-based kicker. They set the deadline for the work to be June 29, and offered a $200,000 bonus for every day the work finished early, else a $200,000 penalty for every day it finished late. This Monday the bids came in and the winner was a bid for ... $867,075, which is to say an amazing 17% of Caltrans' cost estimate. The difference was, of course, in that $200,000 a day bonus. As a major auction, played out on the local stage, the entire I-580 bid is interesting in itself. We may regularly play games that have auctions at their heart, but they're an important mechanic in real life too ... and sometimes by looking at those real life auctions we can come right back to game design. To be precise, Caltrans offered a simple sealed auction, with the winner being the low bidder because it was a cost. This in itself is a wide difference from most board game auctions, which tend to use auctions to value goods (high) rather than to cost services (low). The outcome is probably the same, involving a comparison of outlay to return, but I'm surprised more games don't go in this contrary direction just to be different than the Joneses. As I noted Caltrans cleverly put the expectation out there for what the project should cost. This is a trick also often used by real estate agents, who not only having "asking" prices for the homes they sell, but also tend to quietly mention to buyers how many other people are bidding (and thus "10 other buyers" might be code for "asking price plus $100,000", at least here in the Bay Area). You tend to see it in games as a minimum bid. Wolfgang Kramer's new Colosseum, which I just played for the first time last week, is an example of a game featuring such a minimum. These minimums tend to tighten up auctions by getting rid of all of the irrelevent bidding at the start, but they also make sure that everyone is bidding in the right ballpark, and thus you don't tend to have quite as lucky of a buyer or a seller--which could otherwise entirely offbalance a game. And finally we come back to that kicker of $200,000 a day. This is something that I definitely haven't seen in games, and I think it's the thing that could be more interestingly introduced to a game. Whenever you're playing a good auction game there tends to be some element of risk. You're usually trying to make an adroit guess at the future value of merchandise. Modern Art is one of the most prototypical examples, with people constantly counting possibilities. One of the reasons that I find this mechanic interesting is that it could notably define a player's strategy as a game progresses, giving him real goals: benchmarks for success and possibilities for failure. And it's those successes and failures that make games fun. So how about someone go and design a kicker-services-auction game? I spent half of last night playing the 1830's PA map of age of steam. I solidered on to the end, but some early decisions left me clinging valiently to solvency, only to drop negative in the final turn. A crushing defeat, but the map was interesting enough to pique my interest in another go1. But certainly not right away. This is in stark contrast to another recent game, Rutger Dorn's Arkadia, which we finished after a little over an hour and immediately jumped back in for a second game. This brings me around to what I wanted to point out - The current trend towards shorter heavy games. 2007 domestic2 releases have highlighted a number of strong 60 minuteish games that pack a fair amount of weight into their shorter game length. Compared directly to the heavier releases of the past couple of years, there are more options for heavy 60 minute games than there were last year at this time. I'm not one to shy away from game length. I like 2-3 hour games. Caylus was only too long the first time played3. Age of steam remains a favorite, with a plethora of map options, most weighing in under 3 hours. But the fact remains that the majority of games that allow for strong development and long-term planning are 90+ minutes. 1 Something that isn't as true for the other side of the map, Northern California, which is also a harsh tight map, which left me panting and not actually wanting to play the map again for a long long time. I appreciated it, especially since it represents my home environs, but it wasn't inspiring. 2 By domestic, I mean the US, in my very US-centric fashion. Sorry Australia. 3 Though Caylus quickly went from a 2-4 hour game to a 1-2 hour game, which makes a big difference. 4 Ah, years of gaming bring on the jaded gamers. We all remember early on, when we first found a game we really loved - be it Settlers, or Tigris, or Acquire, or Talisman, or Cosmic, or... and you just had to play it again, and again. It's been a reoccurring theme for me over the past 12 months - the lack of group drive to really dive deeply into a complex game, play it repeatedly, and make it give up all its secrets. 5 Which certainly doesn't qualify as an old game in my book. It's barely three years old. A newbie! But it established itself so completely and so strongly, that now it qualifies as a classic. But it's really still a youngster. Barely into it's twenties. er. fours. 6Whatever your definition of Epic. Choose one that fits. What I'm going to rant on is the huge luck factor in Die Macher. Yes, you heard me right, the luck factor in a 7 hour game... OK, so there isn't a lot of luck in the game, but there is SOME. The biggest luck factor (just about the only one) is in the distribution of position cards among the players and in each region. For example, when the game starts each player has about five (maybe six) position cards and there are ten face-up position cards showing on the game board. Players also have 3 position cards they can use to "swap" out their showing position cards. Well, at the start of the game, I had a match for about two TOTAL showing position cards on the entire board. Meanwhile, there were opponents of mine who had matches with 6 or even more cards showing on the table. I like my idea of an auction for starting position, if I can get folks to try it next time. However, I have yet to find a good house rule (or two) that provides enough flexibility for changing political positions, without dilluting things so much that political positions mean nothing and are changed at the drop of a hat.